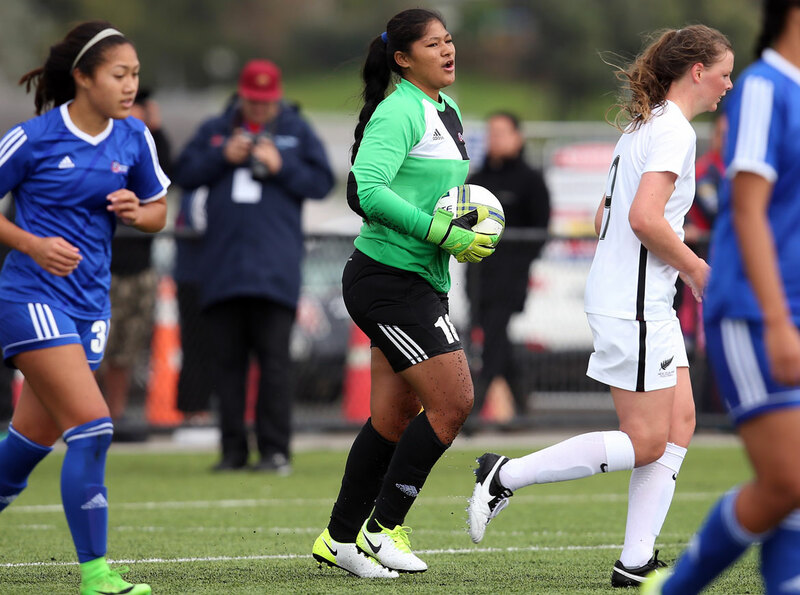 They have one hand on the OFC U-19 Women’s Championship trophy and New Zealand want to make it a clean sweep when they play their final match of the competition against Tonga at Ngahue Reserve tomorrow. While the Kiwis hold an unattainable lead in the standings, three sides remain very much in the hunt for the two remaining positions on the podium. Second-placed Fiji will play New Caledonia and a win or draw for either side would see them remain on the podium, but only if Samoa manages to get a result over Papua New Guinea in the day’s final encounter. New Zealand remain focused on themselves and their own performances rather than those of their opponents. Coach Gareth Turnbull tried a new system against Samoa, a side whose first half performance had the prolific New Zealanders scratching their heads. “It’s certainly the deepest defensive block we’ve come across this tournament which took us a while to figure out,” Turnbull said. However by the second half the Kiwis had their head around their new style and started breaking down Samoa’s deep defending. Whether Turnbull sticks with the changes or reverts to the previous formation remains to be seen, but his side’s ability to adapt means either option will have Tonga working hard. After going down to New Caledonia despite an impressive team performance, Tongan heads are down, but the side is not out yet. Playing New Zealand, while tough, is a challenge most teams enjoy and Tonga will be stepping up to get the best result possible. Coach Christian Koaneti said although the loss against New Caledonia wasn’t what they wanted, the effort from his side meant he couldn’t be too disappointed. “Whatever the result, if I see the girl’s giving their all I can’t be too disappointed with the result,” he said. But knowing the challenge ahead, the side will be hoping that like Samoa, they too can keep a high-scoring side down to as little as possible to end the tournament in the best manner possible. New Caledonia have been on a roller-coaster ride throughout the competition so far. An opening win over Samoa had them on a high before two successive beating came at the hands of Papua New Guinea and New Zealand. They got back on track against Tonga and now coach Kamali Fitialeata wants to see the same winning attitude reflected in tomorrow’s performance against Fiji. Currently sitting in fourth place in the standings, a win over the Fijians could secure New Caledonia a podium finish ahead of their opponent. “Of course we want to finish the competition well,” Fitialeata said. After doing away with Tonga in their opening match, Fiji looked like they might be the side that would cause the most trouble for New Zealand after the defending champions swept Papua New Guinea aside. However Saroj Kumar’s side appeared overwhelmed by their opponent and fell just as hard at their feet. They appear to have righted the ship after a two thrilling matches against Samoa and Papua New Guinea and will have their sights firmly set on one final victory in this competition. The side is hard-working and talented, and Kumar believed the ability of the players to continue pushing their opponents is one of their stronger qualities. “We have taken this competition one day at a time, as I’ve said from the beginning, and we will continue to take it one game at a time. “We are still playing for Francine, we want to keep getting results,” Kumar said. Both sides will be slightly weaker than in previous matches with New Caledonia having to do without starters Cassidy Cawa and Marie-Laure Palene, while Fiji will be without Asenaca Diranuve with each of them suspended for the final match. In the last encounter of the day, and the tournament, Samoa will go up against Papua New Guinea in what should be an exciting match-up. Papua New Guinea proved against Fiji that they’re not a side that gives up easily, and they will need to bring all of that resolve to the field when they take on one of the competition’s most stubborn defensive lines. Samoa’s ability to hold New Zealand to just a 2-0 lead at half-time was proof they’re capable of defending well when required and only the leaders have conceded less goals than the Samoans so far. Coach Martin Tamasese believes his side has shone in each of their matches so far, and he expects another stellar performance on Monday. Having encounter the physicality of Tonga and Fiji, and come off reasonably well, Papua New Guinea coach Rachel Wadunah is confident her team will be able to play to their strengths to once more counter the physical element their opponent will present. She expects her side will also be more accurate on attack, especially after reviewing the match against Fiji and realising just how many chances they let slip through the cracks. “The girls did very well against Fiji but they had a lot of opportunities to score but never put those away,” Wadunah said. Vital Statistics: Four New Zealanders scored hat-tricks against Tonga when the two sides met in 2015. New Zealand went on to win that match 15-0. The Players: Three New Zealanders are currently vying for the top scorer award with Samantha Tawharu leading the pack on nine, with Hannah Blake and Emma Main trailing behind on seven. Vital Statistics: Tonga’s best result to date against New Zealand at this level was a 3-1 loss in 2014. The Players: Seini Lutu continues to impress in her midfield role as she slows up play and puts some terrific balls through for the front line. Captain Halaunga Taholo returns from her one match suspension bringing a calm head and control to the middle of the defence. Vital Statistics: A win for Fiji would cement a second-place finish in the standings, which would be their best ever result at this level. The Players: Captain Luisa Tamanitoakula is a crucial cog with her on-field abilities combining well with her leadership qualities. Defender Cecelia Nainima tracks well and with her height, is able to prevent a lot of long balls from dropping in behind the defence. Vital Statistics: New Caledonia need a win if they want to secure a podium finish, but in any case the six points they have is already an improvement on their campaign in 2015. The Players: Goalkeeper Karine Xozame has been playing with a knee injury since their match against New Zealand, but barely looks like it as she moves with reasonable ease across the goal mouth to pick up a lot of what is thrown at her. Oceane Forest and Alice Wenessia continue to create chances up front for this side. Vital Statistics: Although they don’t have the best goal difference of the participating teams, Samoa have conceded the least goals behind New Zealand. Samoa have conceded 10, two less than Tonga. The Players: After an injury to first-choice keeper Katarina Ah Sui, reserve keeper Jecky Toma has stepped up to the challenge. Her impressive performances began against Fiji and continued against New Zealand as she denied the Kiwis time and again. Vital Statistics: Papua New Guinea were runners-up in 2012 and 2014 before skipping the 2015 edition of this tournament due to their automatic entry to the FIFA U-20 Women’s World Cup as 2016 hosts. They are one point behind Fiji and a win would see them reclaim that runners-up position they covet. The Players: Ramona Padio was shut out of much of the game by Fiji but when she is in possession her control can be devastating to her opponents. The attacking trio of Selina Unamba, Nicollete Ageva and Jacklyn Maiyosi are a force to be reckoned with as they use pace to get in behind their opponents.